Description: This project entails the construction of a new, 24-story structure encompassing 557,000 sf (Phase I) and the construction of a 128,000 sf addition (Phase II). Phase I includes biological research laboratories, chemistry laboratories, a vivarium with related support areas, a BL-3 facility, offices, and a rectory. The chiller plant for this project totals 9,200 tons (with space for an additional 600 tons) and consists of two high-pressure steam-driven turbine centrifugal chillers and four 1,500-ton electric-driven chillers. The cooling towers on the roof consist of nine cells with five primary chilled water pumps of 200 horsepower each. There are five condenser water pumps of 400 horsepower each. The chiller plant is a primary/secondary system. The Phase II addition consists of an expansion to the vivarium, dry laboratories, offices, and an auditorium. The vivarium holds 18,000 cages for approximately 90,000 mice. 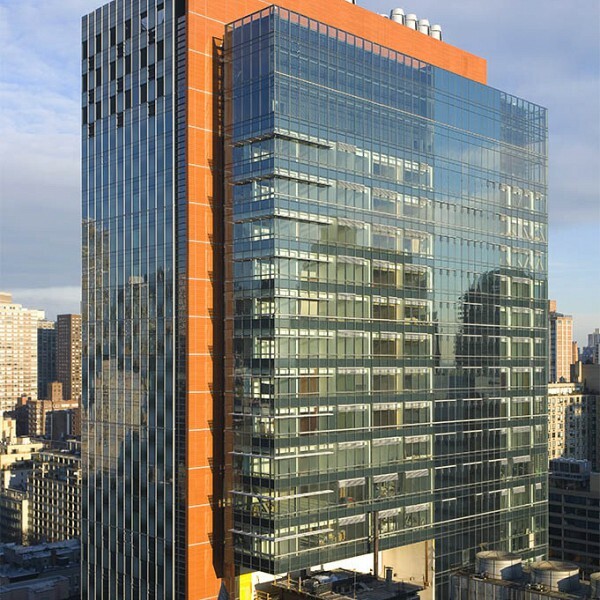 In addition to MEP engineering, Cosentini Information Technologies assisted in the review, selection, and implementation of voice, data, and video technology for the laboratory building, as well as the design and documentation of technology infrastructure for the research support vivarium.